A one-week (18th to 23rd Dec 2017) workshop on "NON DESTRUCTIVE TESTING METHODS AND THEIR INDUSTRIAL APPLICATIONS" was organized by Department of Mechanical Engineering, Vishnu Institute of Technology, Bhimavaram, in association with VIDAL NDT, Vijayawada. The target audience for the workshop were final year Mechanical Engineering students. 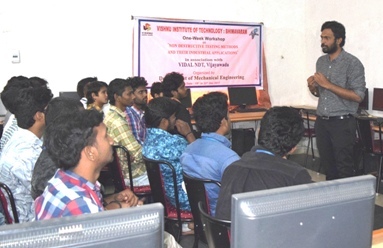 This workshop gave an opportunity to enlighten the students on Non Destructive Testing techniques by providing an overview of the techniques and hands on experience on the equipment. Students also learnt about the basic principles of various NDT methods. And importance of them in Industrial applications.